Forged in the suburban sprawl between Philadelphia and New York City, SAINT SLUMBER is an all-American rock band. Formed in the small, quiet towns of their upbringing, the alt-pop trio is comprised of vocalist Joshua Perna, guitarist Aaron Brown, and drummer Matt Carpenter. Self-producing all of their own records, their creative autonomy was first seen in the band’s 2017 debut EP entitled YOUTH//1. An expansive record for its breadth, SAINT SLUMBER juxtaposed the sounds of dreamy, electronic pop alongside alternative rock on their five song EP, pairing it with the EDM-indie crossover single "Hazy." 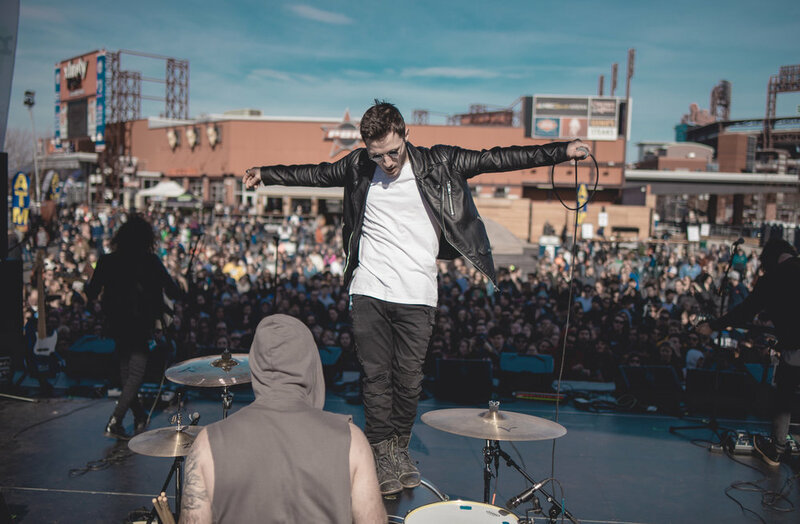 In its first year, the band's debut tracks accrued a million streams as they finished the year strong by playing Philadelphia's Winter Jawn Festival with Dashboard Confessional and the Struts to a record-breaking crowd. SAINT SLUMBER began it’s second year with a bang, playing Radio 104.5's Birthday Bash with 30 Seconds to Mars, Portugal. the Man, and Walk the Moon on their Philadelphia stop of the Monolith Tour. The band soon after announced their next record and the second installment in their YOUTH// trilogy: YOUTH//2. The band released an ambitious string of singles and music videos, acquiring features and support by Billboard, Nylon, and Alt Press as they released YOUTH//2 in September of 2018. After supporting the record with a tour with Young Rising Sons, the band wasted no time and released a subsequent single entitled “FEVER.” The track, which is a dramatic, alt-pop reworking of the classic R&B standard, was featured on Spotify’s New Music Friday. SAINT SLUMBER's new single “FEVER” is out now. Look for the final installment of their YOUTH// trilogy in early 2019.